Keeping smiles healthy for the families in Pittston and the surrounding communities. General Dentistry focuses on preventing small problems from becoming bigger, expensive issues. It’s a crucial part of ensuring your smile stays healthy. Also, a healthy smile keeps your overall health in tip-top shape. Studies have shown oral diseases, such as gum disease, have a direct connection to health risks, including heart disease, diabetes, preterm birth, and so much more. Learn how our services will help keep smiling. We believe dentistry should be catered to your needs, which is why every checkup with our team will be far from routine. Coming into our office every six months is the first step to keeping you and your family’s smiles healthy. 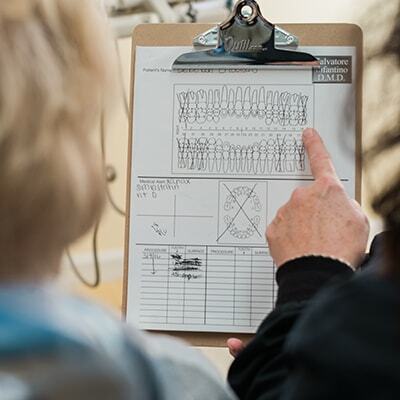 This allows us to stop dental issues from evolving by using modern technology, such as digital x-rays and intraoral cameras to examine your teeth, gums, bite, and overall wellness. We have two wonderful hygienists at our office who work extremely hard to deliver gentle and thorough cleanings. A regular hygiene visit happens the same time as your comprehensive exam, where we’ll get rid of excess plaque and tartar. During this visit, our hygienists will also provide useful advice on how to brush and floss and will answer all of your questions. If we suspect severe gum disease, a scaling and root planing treatment is needed to get rid of the harmful bacteria, which is a deep cleaning conducted by our friendly hygienists. Did you know about 9,700 people will die of oral cancer? Despite this scary statistic, it’s possible to beat this cancer with early detection. We love this community and we’re committed to beat this disease by doing an oral cancer screening during your checkups with us. By catching the early signs of oral cancer, you and Dr. Sal can immediately plan the next steps to prevent this disease from worsening. If you are experiencing pains and sores in the mouth (that aren’t going away), please contact us and we’ll be happy to do a checkup. Your molars (teeth in the very back of your mouth) can be extremely difficult to clean because of their deep grooves. Food debris is more likely to get trapped, which can lead to tooth decay if not treated properly. That’s where sealants come in, which are thin, tooth-colored coatings painted on the surfaces of teeth. This protective layer prevents tooth decay by sealing it out. We usually do sealants for children who are more prone to tooth decay; however, we do have them available for adults as well. The tooth nerve (the inside of your tooth) is the heart of a tooth; it’s what keeps it alive. When it becomes severely infected (improper hygiene or an accidental trauma), Dr. Sal, your dentist in Pittston, PA may recommend a root canal to save the tooth. If you think getting a root canal will be a traumatic experience, don’t worry! Modern technology and our team’s caring nature will ensure this process is as painless as possible. Sedation Dentistry is available: Our team is excellent in helping you feel comfortable and taking treatment at your own pace. However, if you feel you need an extra boost to feel comfortable, we have adult sedation available to calm your fears. In fact, you may even forget the entire procedure. No need to travel from office to office: Dr. Sal is trained to perform root canal therapy, eliminating the need for you to see a specialist. You’ll see the same friendly faces from start to finish. Straightforward treatment: We’ll make the entire process easy for you. Dr. Sal will comfortably remove the diseased tissue and nerves and will fill the tooth with durable material and place a crown. You’ll hardly know you received a root canal. Too good to be true? Talk to us to see what we can do for you. I recommend Dr. Infantino to anyone who is afraid of going to the dentist. I don't do well with pain and due to an issue many years ago, I've been terrified of needing dental work. I had a root canal today, my first adult dental procedure. I have to say, Dr. Infantino far exceeded my expectations. No pain what so ever!!!! My biggest fear was the needle for numbing and I didn't feel a thing. Can't forget to mention his amazing staff either. Very supportive and caring individuals!! Your path to a healthy smile is only a phone call away!